Please inform Ilioperato in advance of your expected arrival time. For this, you can use the special requests section when making the reservation or contact the accommodation directly. The contact details appear on the booking confirmation. Open-plan room with double bed and sofa bed, bathroom with shower and a private balcony with views of Caldera and the sunset. It has a maximum capacity of 3 people. 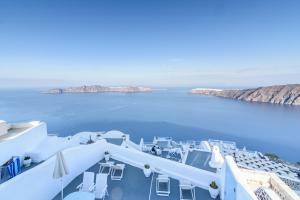 Open-plan room with double bed, bathroom with spa bath and private balcony with views of the caldera and the sunset. No additional guests can be accommodated. This cave apartment has a bedroom with a double bed, a private bathroom, a loft room and a living area with a second bathroom. 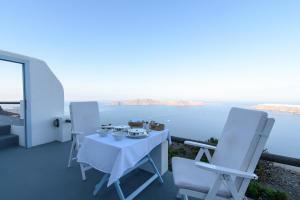 Offers access to a shared terrace with views of the caldera and sunset. 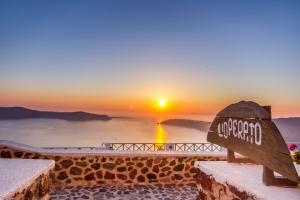 Room of 2 spaces with bedroom with double bed, living area, bathroom and shared terrace with views of the Caldera and the sunset. This open-plan room has a bathroom with a rain shower and a private balcony with unobstructed views of the caldera and the sunsets. This apartment has an 1 cave-style bedroom with a double bed and a private bathroom, a living area with a sofa bed and a second bathroom. It opens onto a shared and furnished terrace.